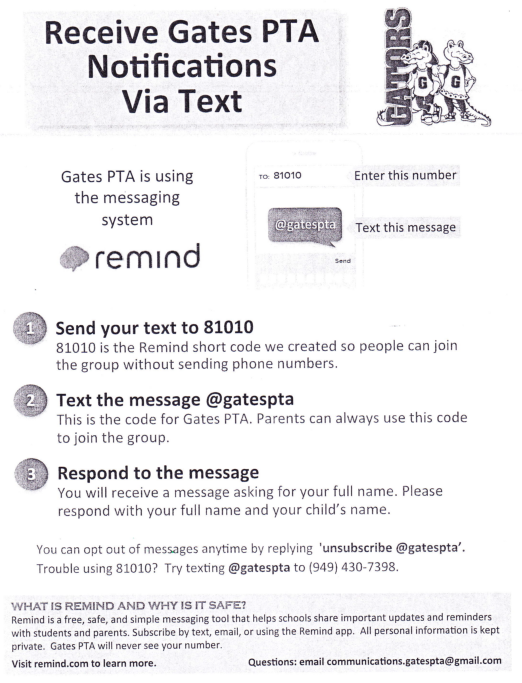 Gates PTA utilizes a number of communication avenues that fit the need for our members to gain this essential information. 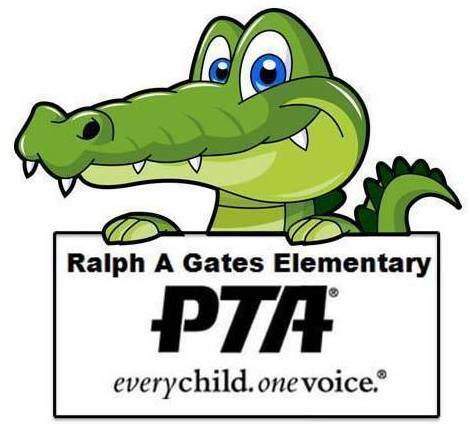 The Gates PTA Communications team helps get the word out about school events, volunteer needs, and community news through front office postings, e-mail, Facebook, flyers, text, phone messages by Mrs. Estling, posters, translators, and this website. You may also contact a specific Communications Chair directly with questions or comments. The PTA creates a school year calendar that it sent home at the beginning of the year. PTA submits information that is included in Principals, weekly email blast. Our PTA President will also send out an email blast occasionally with additional PTA updates. To be added to the Gate PTA email address list send an email to gatespta@gmail.com with "add me" on the subject line. The Gates PTA sponsors a Gates PTA facebook fan page for parents to join. Our Publicity - PTA Copies, Publicity PTA Copies Chair works with the PTA Chairs to produce copies of PTA information that we send home with students. This year we’ll be using Konstella, a very helpful communication tool, for all our classroom and school-wide PTA communication. Konstella will make staying organized easier and help build a secure and private parent community here at Gates Elementary. So when your Room Parent emails you an invitation, please accept your invitation! It provides a single location for your child’s/children’s activities, including class announcements, parties, school events, and sign-ups. Your personalized calendar in Konstella automatically includes all upcoming activities and (non-academic) deadlines for your child’s class and Gates Elementary. This calendar can be synced to your own personal electronic calendar. Parents can communicate with other parents about various topics via a message board. If interested in a topic, you can subscribe to a particular thread and respond directly from each email. This is beneficial in discussing topics such as good summer camps or class-wide playdates, or finding parents with similar interests. Parents will have the ability to communicate directly with the parents of their child’s friends to schedule play dates or invite friends to activities. Parents can join a Gates PTA committee or volunteer for a PTA job with just one click. Please add konstella.com to your email program’s safe list. Please customize your privacy settings by clicking your name, then Settings. Feel free to download the Konstella App on your phone! Privacy notice: Konstella is a secure site and your privacy is of utmost importance to us. You will control your privacy settings within the tool, so you decide what you would like to share with other parents. Your information will not be accessible to third parties. The Gates Principal, Mrs. Estling, communicates with all parents through a telephone-caller system to enhance communication with the school community. If you do not receive the phone message, please contact the school office. The Gates PTA sponsors a Pintrest Boards to share ideas. Our Posters, Publicity Poster Chair, works to create poster for PTA events to help get the word out. The PTA has created a team of translators who help to translate information being sent home into Spanish to reach our Spanish speaking members. The Gates PTA website provides information on Gates PTA programs, fundraising, communications, membership and links to useful websites. The website contains a wealth of information updated frequently.